-Have you heard of the new Target Cartwheel app? Seriously, it's the coolest thing to ever happen to a Target loving girl like myself. Aside from an afternoon alone to meander the aisles with a pretzel combo, this is possibly the next best thing. Basically, it's an app for iphone (no idea if they have it for other phones, but I'm sure they do) where you can get special coupons to all sorts of things at Target. From groceries to shoes to home decor. All you do is "check" the coupon you wan't and it adds them to your "cartwheel." You can add a bunch at a time and then when you're ready to check out, you just have to show the cashier ONE barcode to scan and it will automatically apply the coupons to what you bought. I love it! -We went to see my sister in Houston for a day and whenever we go there, we have to go to Ikea. Because San Antonio doesn't have one, which is crazy, I know. But it's sort of a good thing, because it gives me time to plan what I want/need so when we go I know excactly what I'm going for. This is important when it comes to Ikea cause ya'll know how massive it is and it can be super overwhelming to say the least! Especially with 3 kids in tow. So, I sort of had a plan this time. 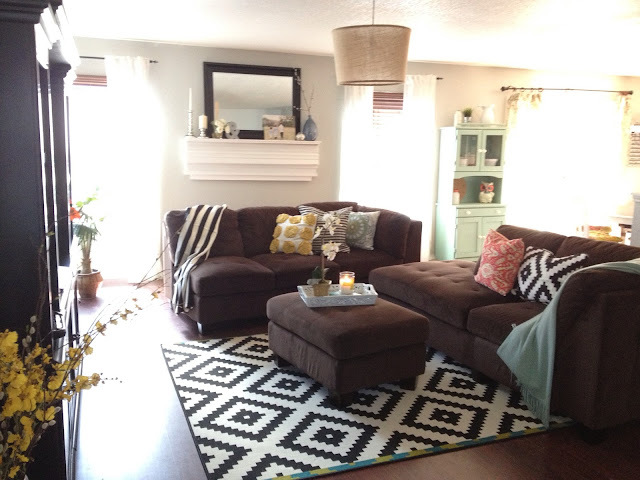 I wanted the black and white throw (top left-ish) to tie in with the rug I'd got there a few months back. I've always loved the simplicity of black and white. And I love how these few items added that into our living room space. +Speaking of decorating your home, I have to give a shout out to my friend Ashley. She is doing a "Living Small" series on her blog where she gives a tour of her 2 bedroom house. She gives awesome advice and tips for living smaller, with 4 kids. I LOVE her home and what she has done with it. Go check it out! This is a book I am currently reading and loving. It's a slow process because I find myself wanting to do anything else but read when I get a little quiet time (the irony of this is not lost on me) but I'm making myself read it and feeling challenged, in a good way, with every page. On that note, I am looking for a new morning devotional. I want something a little challenging and not too short. I will have more time in the morning to spend on some bible/prayer/reading time once the kids start school and want something a little more on the deeper side. Jesus Calling is great, but it's pretty surface. I would love some new recommendations! If you have any please share them! The UK needs Target. I have serious store envy haha. And if you find a devotional I'd love to hear about it. I know what you mean about Jesus calling. I love it but sometimes I just want something a little more challenging! I love My Utmost For His Highest by Oswald Chambers. It's my favorite for sure - not very long but very deep. I also enjoy Streams in the Desert - it has a different feel to it; more poetic. 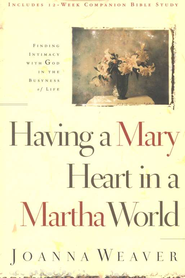 I have read having a Mary Heart in a Martha World three times and continue to go back to it and reference Joanna Weaver's amazing ways of identifying heart issues. Her next book, Having a Mary Spirit, is PHENOMENAL, and I would recommend reading it after. Love the black and white with the brown! I love the rug and pillow covers! I have those exact same items on my ikea list....which the closest one is 7 hrs away but at least I will be prepared if I'm ever in the area. 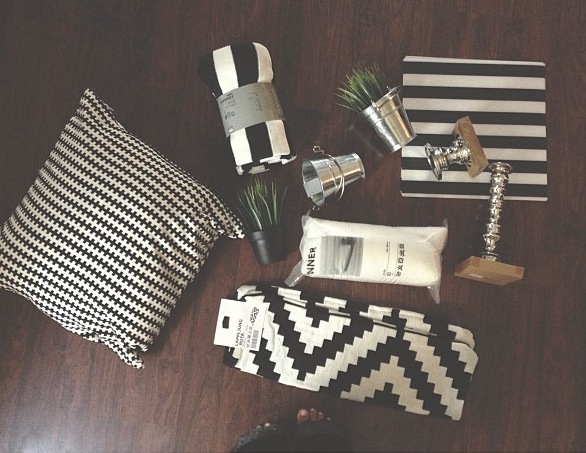 :) love black and white. And downloading that app RIGHT now!! YOUR LIVING ROOM LOOKS FABULOUS! I love how the base of everything has brown tones but you've added in just the right touch of black and white to pull it all together! Well done friend! Looks fabulous! I wish we had an ikea close. Closest one is Atlanta, which is 4 hours. BUT WORTH THE DRIVE! I'm going to go before I have this baby! I love it! Let me know what morning Devotional you're gonna start. I'm searching for one too. I have my Jesus Calling book but I want something a little more involved. Quick but thought provoking. I need to read that book you suggested, I've heard lots of good things about it! I'm going to download that app ASAP. And seriously I have been looking for a new devotional, if you if one let me know. Just got the app, thanks girl! Kathleen Nielson studies are my favorite. Her purpose is to get you into the Word and equip you to better understand the text. Good luck! We don't have an Ikea in KC either, but we are supposed to be getting one in the area soon. I have never even been in one. I cannot wait to peruse the aisles when it opens. I have always loved that rug. It all looks fab!